All one has to do is take a look at wood blinds, in person, to comprehend why they are such a popular choice. Quality should always matter, when it comes to your window treatments and your home, and wood certainly offers the finest in quality. What is equally as important is making sure that you have a professional company to count on to help you make sense of the process of selecting and installing wood blinds in Charlotte. Your home is your biggest, and most important investment. The details that go into the interior design are what helps your current house become your dream home. Yet understanding your possible selections, and making essential choices, is also about having the professional guidance required to make sense of it all. Sweet Shutters and Shades proudly holds the title of local leading window treatment service provider and source for real wood blinds in Charlotte, and this is an honor we take great pride in. Company founder, Diane Sweet, brings with her over two decades of hands-on expertise in the window coverings field. You can feel confident about the quality of service, products and final results that you get by working with our Charlotte window blind company. While the upfront cost of wood blinds is steeper than other choices, the return on investment makes up for it. Adding this level of quality window treatment to your home is going to increase the property value, making them a wise financial decision. Quality window coverings always help with improved energy efficiency. Wood acts as an insulator and that helps keep your heating and cooling costs lower. Not to mention, this is ideal for making your home more eco-friendly, too. 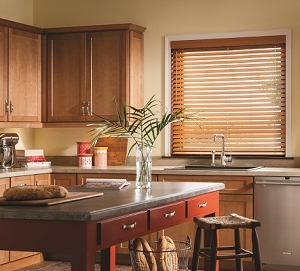 The wide slats and nonporous surface make this an easy window covering to clean. Not only that, but it makes them a wise choice for anyone with allergies, asthma or other breathing-related health conditions because the dust doesn't stick around. Before making any choices, select the right team to work with to better understand the options available for window blinds in the Charlotte area. You may find you prefer the price range and moisture resistance of faux wood blinds more than their real wood counterpart. Sweet Shutters and Shades is the only name that you need to know for getting the finest in wood blinds. From the moment you set up your free in-home consultation, you will feel good about the level of service we provide for you. Let us show you various wood choices and finishes, and show how they would look, in your home. If you would like an estimate for custom wood blinds in Charlotte, NC or the surrounding areas, please call Sweet Shutters and Shades at 704-980-4303 or complete our online request form. Excellent service from start to finish! I highly recommend Sweet Shutters and Shades. I would recommend this company for their ethical practice, attention to detail, and fair pricing. Our windows look sweet and now have a new, updated look that we love.